"Mountain Sun Goddess" is a Luxury Golf Course Home, located on the 15th Fairway of Bald Mountain Golf Course located within Rumbling Bald Resort. Expansive Rock Face Mountain views of Rumbling Bald Mountain. Located about 2 miles from the "Heart of the RBR Amenities". While Staying at MOUNTAIN SUN GODDESS you will enjoy: * Tranquil Private Mountain view and GC Setting. * Wi-Fi and Local Land Line. * Perfect location with Western Views. 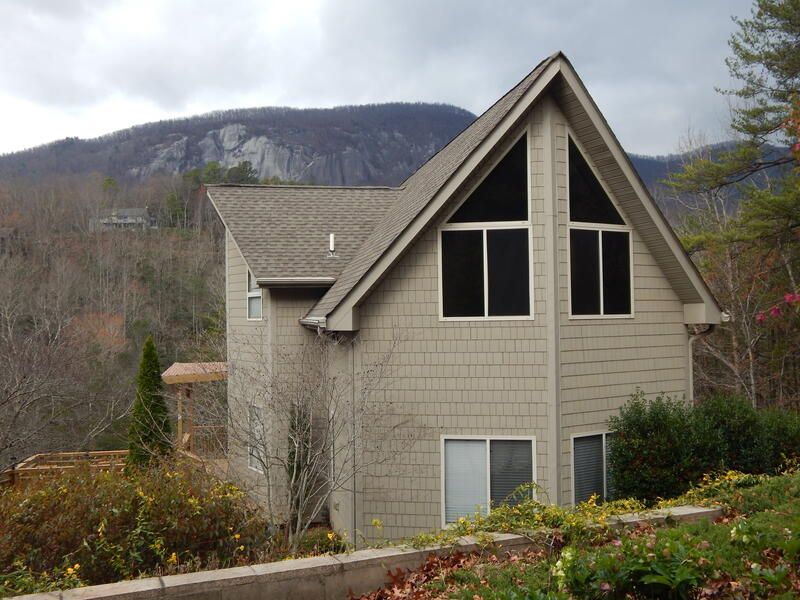 * Close to Ingles Supermarket, Downtown Lake Lure, Chimney Rock State Park, Asheville and Biltmore House. * 3000 Square Feet, ample room for large families- 4 bedrooms, 3 baths, 2-Great Rooms, 2-Gas Fireplaces. * Gas grill off kitchen, decks with plenty and seating. 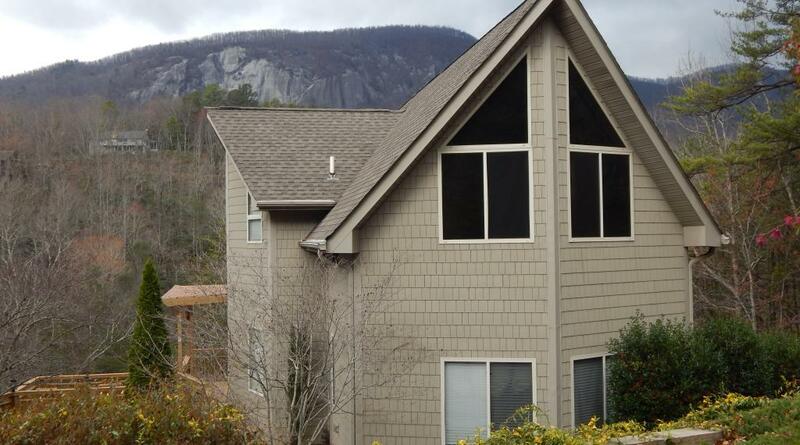 "MOUNTAIN SUN GODDESS" has the perfect set-up for families, plenty of room to spread out to enjoy your vacation. Gather on the decks for the wonderful mountain evenings with friends and family. The Second Level: * Master Bedroom- King, Full Bath, separate Sitting Room with pull out Queen size bed. The Main Level: * Great Room, Gas Fireplace, Flat screen TV, Kitchen/Dining, 2 Bedrooms each are a Queen with full bath. * Plenty of deck space. The Lower Level: * Great Room, Gas Fireplace, Flat Screen TV, Decks, 1-Bedroom with Queen and Full bath. "MOUNTAIN SUN GODDESS" has Easy access to all resort amenities. You can rent a golf cart from the Bald Mountain GC to maneuver thru-out the resort. If you like to fish please have a fishing license for Lake Lure. There is local hiking, water skiing, golf and so much more!! Located within an hour’s drive are Chimney Rock Park, Biltmore Estate, Hendersonville, Flat Rock and the Tryon Equestrian Center. As guest of “MOUNTAIN GODDESS” you will have access to all resort amenities, including beach & lakefront swimming, two 18 hole Championship golf courses, two driving ranges, 3-restaurants, 2 lounges, 3 swimming pools (one indoor heated), indoor whirlpool spa, Spa, lighted tennis courts, horse shoes, fitness room, playground, miniature golf, daily adventure outings (May- Oct.). Your passes that you receive will allow you to use the pools and fitness room for free. If you like high adventure there is local whitewater kayaking, zip lining, rock climbing, hiking, mountain biking and waterfall hikes.